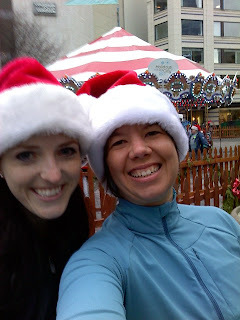 Ah, the Jingle Bell 5K...loved it! All the festive costumes and hats and bells ringing, it was just so much fun. Since Trav was being a poohead and didn't want to make the drive to Seattle, I had the privilege of carpooling with Kerrie--and I'm SO GLAD I did! Kerrie picked me up from the house at 7:15 on the dot and we drove to the super secret parking spot that was absolutely perfect for the occasion (no waiting for long lines of cars after the event! Definite WIN!). Walking to Westlake was fun because we kept seeing all sorts of people dressed up for the event, including Jesus, a slutty Mrs. Claus and Santa Claus himself! And of course there was an abundance of bells. And TUTUS! We totally agreed on making awesome tutus for next years race! Just get all sorts of tulle and glitter all over the place. Woohoo! 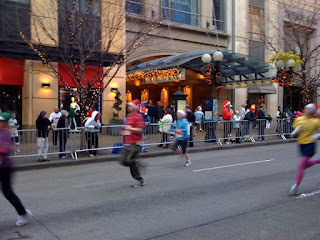 The course was an interesting loop-like jaunt around downtown, through the Express tunnels and back around to Westlake. Everything was going pretty well, despite Gus freaking out about another tunnel (he's a little scared of dark enclosures), and then the course veered up Boren street...giant hill. A mean hill. But then that mean it was downhill ALL the way home to the finish line. And it was in sight! So I was booking it like I was being chased by a [insert scary fast object/animal here]. Somebody had projectile puked in the middle of the street on the downhill portion, and it seriously had had some crazy velocity behind it. Gross, I know. I made sure to avoid those two giant splatters. Ick. .23 - 1:23 (6:02 pace?!?!?!) Yeah, where in the hell did THAT come from? 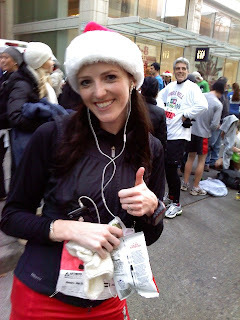 Overall, it was a very cool race with good company and yummy swag (Top Pot Doughnuts!). After grabbing a quick coffee at Nordstrom, we headed back to the waiting 'Bu (Kerrie's hubby's Malibu) and it's heavenly seat warmers!! Yes! WIN! Great job at the race girl! 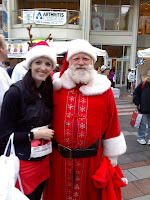 I love me a Christmas themed 5k! I missed out this year! I got your Christmas card last night, you guys are SOOOOOO adorable!!! Thanks so much! Looks like a total blast! Glad you had a great time and avoided projectile puke.. GROSS! Love the pics! OMG - I saw the puke too. I'd forgotten...till now. Thanks! I had so much fun - so glad we got to go together. We'll have to do that more often! Thanks for the card! It's awesome! I sent mine out in the mail as well so hopefully you'll have it by the end of the week. The race sounds like a lot of fun! And you got a nice time to top it off. Looks like a fun race. And my God, you are FAST!!! mmm puke. sounds like a great race otherwise! :) slutty mrs claus, what a costume. lol. Sounds like a great race! Obviously somone took it a little too hard on the uphill. Yuck! What? Post race donuts? Where do I sign up? 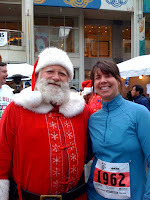 I really want to do this next year....but carpool for sure I am a Seattle driving chicken. You look so cute! And great job at the race!! You really went all out and did excellent. :) YAY! got your card today! Thanks! Love it! LMAO at slutty Mrs. Claus. Great job on the race! Malibu's come with SEAT WARMERS? wow, I guess it's ain't the 90's anymore. Nice job kiddo. I'll use this as my benchmark time for when I come back with my first 5K post-injury. Loser sends the other person donuts.